Electric Pedals is a maker and provider of pedal powered installations. From its workshop in Peckham it offers a full production service. It is also an event hire company for bicycle powered cinemas, music stages, energy awareness events, workshops and other activities. “I have to say that I love the projector. It's superb and far superior to other brands that we tried. The build quality is great, it has a smaller chassis and is 100% brighter for the same energy consumption than others. It also auto starts and you can set it to connect automatically to the HDMI. Perfect for what we needed." 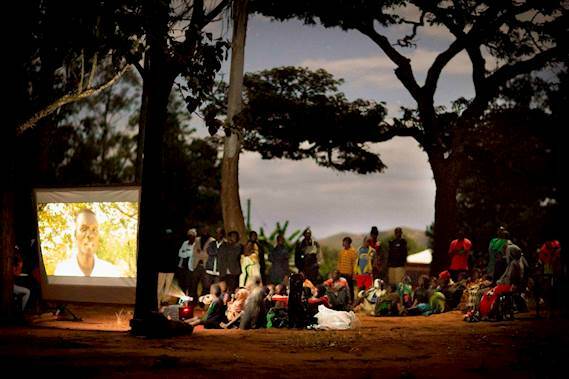 Challenge: As part of a countrywide roadshow focusing on elephants and the illegal ivory trade in Malawi, Lilongwe Wildlife Trust (LWT) needed a portable pedal-powered projection solution to share its inspiring educational documentaries with communities in remote areas. Solution: Electric Pedals custom-built a backpack cinema kit which uses human energy to generate the electricity needed to project a film. The kit consists a portable pedal generator and the ‘OWL’ - a specially designed cinema system using Optoma’s ultra portable LED projector, ML750e. 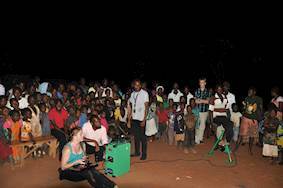 Results: LWT toured communities and schools and, in six weeks, reached over 14,000 people with the backpack cinema kit. The equipment has massively expanded LWT’s reach and been immensely popular with the communities visited. Conservation Education is a vital part of the work done by Lilongwe Wildlife Trust (LWT). It inspires people to protect their natural heritage by developing a greater understanding of wildlife, the environment, and how to live sustainably. 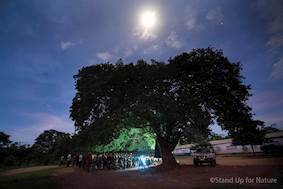 The trust has access to a great range of educational documentaries but screening these films can be problematic in remote areas which have neither electricity nor fuel to power a generator. So it needed a portable pedal-powered answer to the problem. With the help of the British High Commission, Electric Pedals and Optoma, LWT is now the proud owner of a pedal-powered cinema kit. The custom-made equipment developed by Electric Pedals uses human energy to generate the electricity needed to project a film. 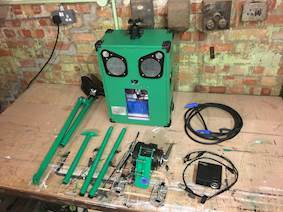 The backpack cinema kit consists of a portable pedal generator and the ‘OWL’ - a specially designed cinema system all contained in one small box. On top of the OWL sits Optoma’s ultra portable LED projector, ML750e. Weighing just 18kg, the entire kit, including projector, fits into a rucksack. It can be easily carried across rivers and through dense undergrowth to be set up on site in minutes. Powered by constant but relaxed cycling, communities simply attach a USB drive and show music, pictures or full length films through the projector for the whole community to enjoy. It uses ultra capacitor technology rather than batteries, making the system 100% pedal-powered, rather than relying on lithium batteries which would deteriorate over time. 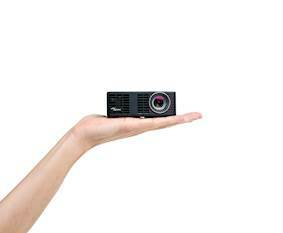 The ML750e HD Ready LED projector was perfect for the backpack cinema kit as it weighs just 380g. It has a media player, native office viewer, built-in speaker and HDMI connectivity. Projection without a laptop is straightforward using its on-board memory, a microSD card slot or its USB connection. Colin Tonks, inventor of Electric Pedals, said: “I have to say that I love the projector. It's superb and far superior to other brands that we tried. The build quality is great, it has a smaller chassis and is 100% brighter for the same energy consumption than others. It also auto starts and you can set it to connect automatically to the HDMI. Perfect for what we needed. LWT launched the equipment in January as part of a countrywide roadshow focusing on elephants and the illegal ivory trade. In partnership with an NGO called Stand up for Nature, LWT toured communities and schools and, in six weeks, reached over 14,000 people. Understandably, in areas where human and wildlife conflict had been an issue, opinions towards elephants were more divided. There was however a resounding understanding of the importance and value of these iconic animals. It was especially encouraging to see an obvious improvement in the understanding of the next generation, who have been receiving environmental education in their schools. LWT’s outreach teams have used the equipment to massively expand their reach. The project has been immensely popular with the communities visited. Village chiefs and teachers have welcomed the development. One chief said “It is so nice for our children to see such wonderful films which have educational value, please do come back as soon as you can”. Electric Pedals now has 14 Backpack Cinemas around the world to ignite ideas, stir debate and help far-flung communities. It has brought films to some of the most remote places in the world, including Tanzania, Sénégal, Uganda, Malawi, Congo and Madagascar.